As a commanding central defender, Aizlewood featured in two promotion campaigns for the Blues. He died at the age of 60, following a short illness. A Welsh schoolboy international, he made 201 appearances and scored 13 goals before retiring from the professional game in the summer of 1984. Aizlewood played in three divisions for Pompey. His wholehearted approach and immense bravery made him a firm fans’ favourite. A key member of the division three title-winning side in 1982-83, he missed last month’s Boys Of 83 reunion due to a long-arranged holiday in Spain. According to organiser Jake Payne, he has been considered several times as an inductee in the Pompey Hall of Fame. Payne said: ‘Anyone who saw Steve play would tell you he would put his head in the fire for Pompey, he was that sort of player. ‘He led by example and was the type fans loved, giving 100 per cent but could also play football. ‘He was not just a stopper who would hoof it away. ‘Anyone of that era will say he was a great player for Pompey and I am sure he would have got into the Hall of Fame down the line. ‘It is a committee vote but his name has been mentioned a few times when looking at players from that era. ‘If he is inducted one day, it is sad that will be a posthumous entry and he won’t be there to receive it in person. ‘We recently got in touch with him over the Boys of 83 reunion dinner and he said he would have been there but for a holiday in Spain. Former Pompey striker Ray Crawford also praised Aizlewood. He added: ‘What a player, what a guy. He had his nose broken a few times and was one of those you knew would give you 100 per cent. ‘I would sit in the stands and watch him go out there and dive in to head the ball where others were trying to kick it. 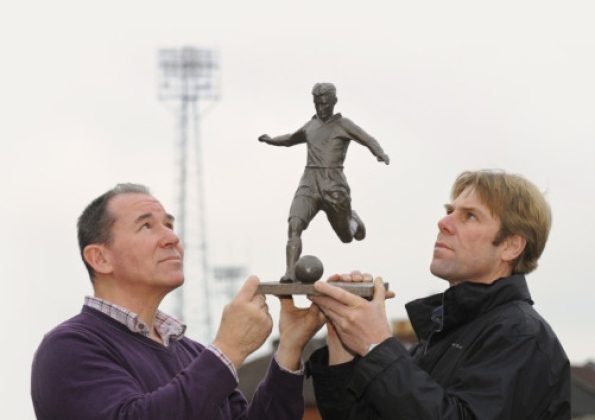 PHOTO: STATUE Sculptor and artist Roger Holman, left, with lifelong Pompey fan Graham Farmer. HE was loved by fans as the ‘gentleman’ of Portsmouth Football Club. And now supporters are pushing for a 9ft statue to pay tribute to Pompey legend Jimmy Dickinson. Dickinson, who played left-half, made 828 appearances for the club and scored 10 goals. He was nicknamed ‘Gentleman Jim’ as he was never booked by a referee during his 20-year career. The proposed statue would go on the corner of Milton Road and Alverstoke Road, in Milton. Graham Farmer, 49, of Milton, is a fan who is spearheading the project. Artist Roger Holman has been picked to design and build the statue. Mr Holman, 50, has recently made a bust of Charles Dickens, which is in Portsmouth’s Central Library. He has made a maquette – a mini model pictured above – to show what the statue will look like. Mr Holman said: ‘The family came to see the maquette, approved it and gave consent for the statue. It’s an honour to make the statue. We want to try and give something accurate. It was great meeting Jimmy’s family and looking through the family albums, as this really helped me with the maquette. ‘It’s been 30 years since he died, so it’s a fitting time to have this tribute. 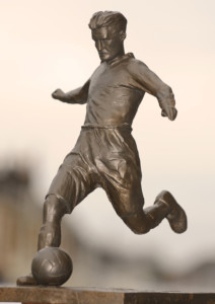 Fans say they have planning permission from Portsmouth City Council and have three years to build the statue. Now £75,000 needs to be raised in order to pay for the plinth, statue and landscaping. Work is under way to come up with fundraising ideas, including a website that people can donate money to. Graham said he recognises that it is a difficult time to ask for money when fans are being asked to contribute to the takeover of the club, but said he hoped supporters would back him. JIMMY Dickinson made his debut for Pompey on May 1, 1943, at the age of 18. He took a three-year break from football to join the Royal Navy, before returning to the club in 1946. Three years later on May 18, Dickinson won his first cap for England, as the side won 4-1 against Norway. It would be the first of 48 international appearances. In September 1976, Dickinson took over as manager. He died in November 1982, aged 57, after suffering from three heart attacks. Former Pompey player Jimmy Stephen has sadly passed away. Stephen, who played for the Blues between 1949-1955, died on Monday. He was 90 years of age. The Scotland international made 103 appearances for Pompey after being signed by then boss Bob Jackson for £15,000, which at the time was a record fee for a full-back. He made his debut in the 2-2 draw with Sunderland at Fratton Park on November 26, 1949. Released in May 1955, he joined Yeovil, before becoming player/manager at Bridgewater. He then played for Newport and Waterlooville. Former Pompey and Scotland full-back Jimmy Stephen has passed away at the age of 90. Jimmy joined the Blues in 1949 after manager Bob Jackson spotted him playing for an RAF XI at Craven Cottage. He signed from Bradford Park Avenue for £15,000 and made his debut in a 2-2 draw with Sunderland at Fratton Park in November 1949. But, as he was still enlisted in the RAF, that was his solitary appearance in 1949/50 as Pompey won the second of their back-to-back league titles. Jimmy made 103 league and cup appearances in a Blues shirt and also won five caps for Scotland. He left Pompey to join Yeovil in 1955 and went on to become player/manager at Bridgewater. He also played for Newport IOW and Waterlooville. Portsmouth Football Club send their deepest condolences to Jimmy’s family and friends. Portsmouth Football Club were saddened to hear of the death of former Blues captain and manager Ron Tindall. He passed away peacefully in his sleep in Perth, Australia at the age of 76. After arriving from Reading, Ron played in almost every position during his time as a Pompey player between 1964 and 1970. He started primarily as a centre-forward, but was later moved back into defence. He even twice took over as goalkeeper for the injured John Milkins in games against Wolves and Watford. When Ron ended his playing days in 1970 he was ready to retire and become Pompey’s full-time coach, a role he had already combined with that of captain. But instead he became the club’s manager when previous boss George Smith moved upstairs. One of Ron’s most memorable matches in charge came against eventual double-winners Arsenal in the fourth round of the FA Cup in 1971. Tindall’s side provided the Gunners with their stiffest test, drawing 1-1 at Fratton Park before narrowly losing 3-2 in the replay at Highbury. When John Deacon took over as chairman in 1973, John Mortimore was appointed as manager with Tindall becoming general manager, a role he retained until 1975. Shortly after, Ron – who also played cricket for Surrey – emigrated to take up the post of director of coaching for Western Australia. TRIBUTES have been paid after the death of Tony Goodall, who was a key figure in setting up Pompey fan groups. The 49-year-old passed away in hospital early on Saturday morning after suffering a stroke two weeks ago. He had been taken to Queen Alexandra Hospital, Cosham, before being transferred to Southampton General Hospital. Mr Goodall, from Old Portsmouth, had worked as a senior executive officer in Whale Island. 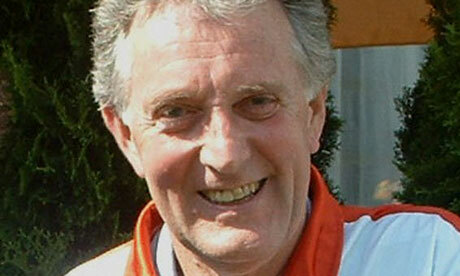 He was a well-known and popular figure among Pompey supporters for his tireless work on their behalf. He was spokesman and co-ordinator for the Pompey Independent Supporters Association (Pisa). Mr Goodall was also a founder member of the Pompey Supporters’ Trust. His passion for Pompey saw him chair the most recent fans’ conference, when administrator Trevor Birch met supporter groups and bodies. Mr Goodall is survived by sons Nick and Sam. I only met Tony in 2010, at a Supporters Direct conference when the Pompey Trust was first being set up. He talked my ears off - about Pompey of course. Since then I have met him at the many, many fans’ meetings; meetings arranged to attempt some agreement about what to do to save our club from those seemingly determined to do it harm. There was no one more involved than Tony and no one who could be said to care in any greater degree. As an exile I kept in touch with Pompey games through Tony’s commentaries on PompeyLiveTV last season and on Twitter this. He had an incisive way of analysing the game that gave a clear and accurate picture of what was happening. We also had many a lively argument on line about the games and about fan politics over the last year. Tony never hesitated to tell it like it is, nor did he take offence if he was paid back in the same coin; a proper debater. He listened as well as talked. Sometimes what he said was hard to take. Sometimes he was wrong, more often it was I who did not understand. But always he was a gentleman. There will be members of PISA who know a great deal more about what Tony did for the fans and the club than I do. No doubt they will write a more fitting tribute than I can. But I want to write my personal thanks to Tony for the understanding he has given me of what Pompey is all about. It seemed to me that Tony loved the City of Portsmouth and enjoyed all aspects of it. He used to Tweet about how grand the City looked at sunset and moan about the kids on scooters in his neighbourhood and describe the odd street scenes he saw. It reminded me of what I was missing. Most of all Tony was for the people of the island and for all the things that tie the community together. He saw Portsmouth Football Club as one of those important ties. It was Tony that gave me the clearest sense of the anger created in the fans by the way the club has been damaged over the last three years and more. He knew what people on the street were thinking and saying and worked to get those people heard. He knew that a football club is more than a profitmaking business and understood the good a proper club could do in the community. It was most appropriate that he took over as Chair of the Fans Conference recently. It seemed to me that with Tony in that role there might be better unity among fans who are trying to rescue the club. It is people like Tony whose values make Pompey worth saving, worth building into something better than it has been for the last twenty or so years. It is important to remember that this is at the bottom of what we fans are trying to do in getting involved in the governance of the club, no matter how we disagree on the surface. Thank you Tony; I feel privileged to have known you and regret so much that I will not get to know you better. Pompey Chimes is saddened to hear of the passing of Brian Bromley. A super player for Pompey in the early 1970s. He was a particular favourite of mine. The following is a squad list taken from a 1970 photo which is unfortunately copyrighted, but brings back many fond memories. Former Pompey midfielder Brian Bromley passed away suddenly at Southampton General Hospital on Friday, March 9 at the age of 65. George Smith brought Bromley from Bolton – where he started his career and became a youth international – in November 1968 for a fee of £25,000 to replace Bobby Kellard. He played 95 second division and cup games for Pompey – scoring three goals – and often wore different numbered shirts as he showed his versatility in midfield and forward roles. Two of his best matches in a Blues shirt were against Millwall in a 3-0 win shortly after he joined the club and a 3-1 triumph over Swindon the following season. 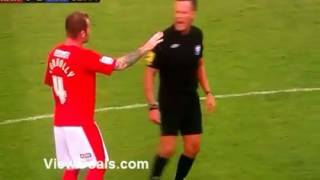 Bromley will also be remembered for being sent off in an FA Cup replay at Highbury in 1971, making him the first Pompey player to be ordered off the field in any match for six years. Among his team-mates at Fratton Park were John Milkins, Ray Hiron, Nicky Jennings and Albert McCann. Brian’s away match room-mate in later years was fellow Lancastrian Colin Blant. An ankle injury restricted his progress in the 1971/72 season and he was allowed to join Brighton in January 1972. Brian then moved on to Reading, Darlington and Wigan before returning south to end his playing days with non-league Waterlooville. Bromley, who was known to his friends by his surname, ran the White Hart public house in Portchester for many years, before working part-time at the Portchester Social Club near to where he lived. He was an occasional spectator at Fratton Park and was sat in the south stand for January’s match against West Ham. Former Pompey inside-forward Terry Ryder has died aged 83. Signed from home-town club Norwich in October 1950 for a fee of £6,000, he was one of the smallest forwards to ever to play for the Blues, standing just five foot and four inches tall. Stepping in for the injured Len Phillips, Terry made his debut at White Hart Lane in a 5-1 first division defeat and held the number 10 jersey for another six matches, scoring three goals. He netted a brace in an exciting 3-3 draw against Aston Villa at Fratton Park and bagged another in a 3-2 away win at Derby. Terry’s terrier-like style of play pleased Pompey supporters and made up for his lack of height, but he was unable to hold onto his first-team place. An injury to Duggie Reid in the 1951/52 season saw him fill in for five more first division games, including an away match at Huddersfield in September 1951 when he scored the winning goal. 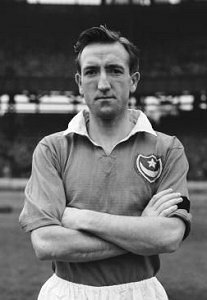 After a contribution of four goals in 16 games, Terry left Fratton Park in July 1952 to sign for Swindon, where he netted 13 goals in 34 matches. Portsmouth Football Club would like to send their condolences to Terry’s family. He signed from his home-town club Norwich in October 1950 for a fee of £6,000 - a lot of money in those days and there is no real indication why boss Bob Jackson trumped for Terry to add depth to his the Champions squad. His stats at the Canaries were only a goal in every four games and at only five foot and four inches he was one of the smallest forwards to ever to play for Pompey. Few thought he would make the grade in a very tough First Division. But just seven days after signing he stepped in for the injured Len Phillips, making his debut at White Hart Lane in a 5-1 defeat and held the number 10 jersey for another six matches, scoring three goals. He was then in an out of the side for the next two season replacing injured players such as Duggie Reid and Peter Harris. After a contribution of four goals in 16 games - the same one in four as at Norwich, Terry left Fratton Park in July 1952 to sign for Swindon, where he netted - 13 goals in 34 matches. The last trace of a football career I can find is at King`s Lynn. Terry`s father George was an active founder of the Player`s Union when he played at Osborne Road - for those who do not know that was the former name of Brisbane Road the home of Leyton Orient. When I asked Ed about Terry he remembered him playing for the reserves mostly and described as the 'little bloke in the reserves` also guessed correctly that he played just a handful of first team games after the Championship years and always did the job asked of him whether wide or in the middle. Condolences to Terry`s family and friends. Jim Riordan was very much involved in the inception of the Pompey Supporters Trust back in 2010 and probably was discussing it even well before. He worked with the Steering Committee and was a cheque signatory until the first Board took up its duties. He was a much loved and respected Pompey Fan and we will miss him. Len Phillips, who has died aged 89, was a prominent member of the Portsmouth football team that won consecutive league championships in 1949 and 1950. Though spotted and signed by Portsmouth while serving in the Royal Marines during the second world war, he was, in fact, a Londoner, born in Shoreditch. At inside-left, he was a classical playmaker who in 261 appearances for Pompey would score 62 goals. Though they were relatively few and far between when Portsmouth won the championship in the 1948-49 season, the team always won when he scored. His total that season was 11 out of the team's 84 goals; he missed only two games. The following season, when Portsmouth retained the title, he played in 34 matches but scored only five times. In the following two seasons Phillips scored, respectively, 11 and 13 goals. It was the manager Jack Tinn, whose "lucky" spats were ceremoniously put on his legs before each game, – as when Pompey surprisingly won the FA Cup Final of 1939 – who discovered Phillips, but the less flamboyant Bob Jackson who took Portsmouth to their triumphs in the league. In 1952, Eddie Lever, a great believer in creative football, who took over at the club and, after selling his uncompromising Scottish international right-half, Jimmy Scoular, to Newcastle United, had the inspired idea of switching Phillips to that position. It might have seemed something of a gamble, since the two could hardly have had more contrasting styles – Scoular was a formidable tackler and hard man, Phillips was ever the constructive artist – but it worked extremely well, above all in the combination between Phillips and his fellow England international, the outside-right Peter Harris. An abundance of gifted English inside-forwards meant that Phillips received only a single England cap in the position, against Northern Ireland in the 1951-52 season. Two more caps followed, the first against Wales in November 1954. Then, Phillips played at right-half for England against West Germany in a friendly at Wembley on 1 December 1954. This, untypically for the times, was an England team full of ball-playing virtuosi, including Len Shackleton, who would score a beautifully flighted goal in a 3-1 win, the ball sailing over the head of the German goalkeeper. The German team, to be fair, was greatly weakened by the mysterious epidemic of jaundice affecting many of the team which had then recently won the World Cup. There might have been other England caps, had Phillips not been injured during training with the squad. In 1956, another injury, a bad one, to a torn ligament, playing for Portsmouth against Grimsby Town, subverted his career. Leaving Portsmouth, he played for non-league Poole Town, Chelmsford and Bath City, scouted on his retirement for Leeds United, and ultimately worked as a lathe operator for De Havilland, in Portsmouth. There were no football millionaires in those days of the maximum wage.He married Joan in 1951 and they had two children. Pompey have just announced the death of long serving Full Back Alex Wilson. Alexander Wilson was born on 29 October 1933 in Buckie in North East Scotland and joined Pompey straight from school. He made his debut, replacing the injured Jimmy Dickinson, at Derby back in October 1951 - it was not a happy day as Pompey were thrashed 5-0, That was followed by a 2-2 draw at the Dell in a Hampshire Senior Cup tie two days later. Alex who could play in both full back roles would not be selected for the first team again until he made his Fratton Park debut against Derby County at Christmas 1952. His chances were few and far between in those early days as Pompey were well provided with full backs - Jimmy Stephen, Harry Ferrier, Phil Gunter, Tommy McGhee and Jack Mansell are names that roll off the tongue and Alex waited patiently for his chance. However after only a couple of dozen games he was surprisingly named in the Scotland squad for the World Cup finals in Switzerland in 1954. He actually played just once for his native country against Finland in a warm up game for those finals on 25th May. Scotland won the game 2-1 in Helsinki - Jackie Henderson was in the same squad. Because of the Scottish FA's lack of money they only took thirteen players to the finals and Alex was left at home on standby. It was not until the 1957/58 season that Alex made a regular first team spot his own after eight years at the club and by the time he made his final appearance at Derby in April 1967 he had played 352 league games (381 in total). He then played a few games for Chelmsford in the Southern League before retiring. He was rewarded for his loyalty with a well deserved joint testimonial with Johnny Gordon. Alex served the club for eighteen years and only Jimmy Dickinson and Alan Knight come to mind as having longer one club careers at Pompey. Alex scored just four league goals for the club and one of those would mark the high spot of his career. It came at the County Ground, Northampton on 24th April 1965 when needing a point to avoid relegation against the already promoted Cobblers Alex struck a late equaliser to save the day. It was more the special as this was Jimmy Dickinson's final Pompey outing and his teammates were desperate that it was not marked by relegation to the Third Division. There are famous pictures of Jim being chaired off the pitch supported by the familiar blonde mop of Alex and mobbed by ecstatic fans. I had the pleasure of meeting Alex all those years ago and saw him play on many occasions in the 60's. I will remember him for being two footed but mostly his neat appearance on the pitch when others went for the more scruffy look. Thanks for the memories Alex. Alex passed away on 29th July 2010 aged seventy six after suffering ill health. His funeral was held in Inverness on 7th August. All at Vital Pompey offer their condolences to the Wilson family. Local boy Peter Harris is Pompey's most successful marksman whose tremendous goalscoring record will probably never be beaten. The flying winger scored 208 goals for Pompey in 516 games in all competitions. But he is not only a hero in terms of goals. He was a Fratton stalwart who won the respect and admiration of many football supporters with his loyalty, dedication and durability in serving his local club for 14 solid years. With 479 appearances, he is the third longest serving player in Pompey history, behind Jimmy Dickinson and Alan Knight. Born in Portsea, Harris joined Pompey just before the end of the second world war. He was a wing forward with an astonishing turn of speed, prodigious pace and a stunning weight of shot. He developed impeccable ball control and accuracy in shooting which made him one of the most prolific goalscorers of the immediate post-war era; remarkable considering he was a winger. Rated by many in the same class as Stanley Matthews and Tom Finney, he became the undisputed owner of the number seven shirt from 1947 to 1959 until a serious chest illness brought his career to a premature end. During Pompey's two championship seasons, Peter netted 33 goals and ended top scorer at Fratton Park in a further five different seasons. His first hat-trick came at The Dell during the war and his first peace-time triple came against Stockport County in the FA Cup in a 7-0 win in 1949. He scored five more hat-tricks throughout his career together with four against Sheffield United in 1954 and all five in a 5-2 win over Aston Villa in one of Peter's last games, aged 32, in 1958. Yet ironically, Peter was capped only twice by England; first against Eire in 1949 at Goodison Park, one of Peter's favourite grounds, and then four years later in Budapest as England crashed 7-1 to the Hungarians. Peter, who retired to Hayling Island, is still fondly remembered by today's older generation of Pompey fans for his flying runs down the wing. Most record books state that Peter Harris scored 194 league goals for Pompey. The true figure is 193 because one goal at Newcastle in November 1953 that Peter originally claimed, was actually an own goal.